At 83º north, at what is basically the most northern piece of land on Earth, UBC researchers were hunting down and studying cyanobacteria. Several thousand kilometres away and some time later, in a lab at UBC, an experiment was conceived, yielding surprising and important results. Caroline Chénard was a PhD student studying cyanobacteria, a type of photosynthetic bacteria, in the freshwater lakes that form every summer on the ice shelves in the high Arctic. She, with UBC researcher and virologist Curtis Suttle, wanted to find out what role viruses played in the arctic ecosystems. What they found was much more surprising than they could have imagined. Using a cousin of the cyanobacteria they were studying in the arctic as a model, and a virus that infects that cousin, they decided to sequence the genome of the virus. They found that the virus had stolen a copy of a bacterium's (a singular bacteria) immune system, a system called CRISPR. CRISPR has been making headlines in the last few years for its use in biotech and genetic engineering but it has a much humbler origin. Bacteria use CRISPR to remember viral infections and fight them off if they ever encounter them again. "You can think about [CRIPSR] as pieces of string,” explained Suttle. "Each one of these pieces of string represents a string of DNA." There are red pieces of the string which all have identical DNA sequences and are elements found repeated in a CRISPR. These red pieces are separated by strings of all different colours. Each colour represents a different piece of DNA stolen from a virus that has infected the bacterium. If a virus infects the bacterium and has string that matches a colour in the bacterium, the virus's string will be destroyed. This means if the bacterial CRISPR recognized the viral DNA, the viral DNA will be destroyed and won't infect the bacterium. The bacterium can use CRISPR to remember, detect and destroy viruses before they become infected. But CRISPR isn’t usually found inside a virus — it doesn’t need immunity from viruses, after all, which makes this discovery all the more intriguing. “The logical conclusion is that when this virus infects the cyanobacterium it brings along with it the capability of allowing cyanobacterium, the organism it is infecting, to fight off infection by other viruses. But it doesn’t carry any immunity for the virus that’s carrying the CRISPR array,” explained Suttle. 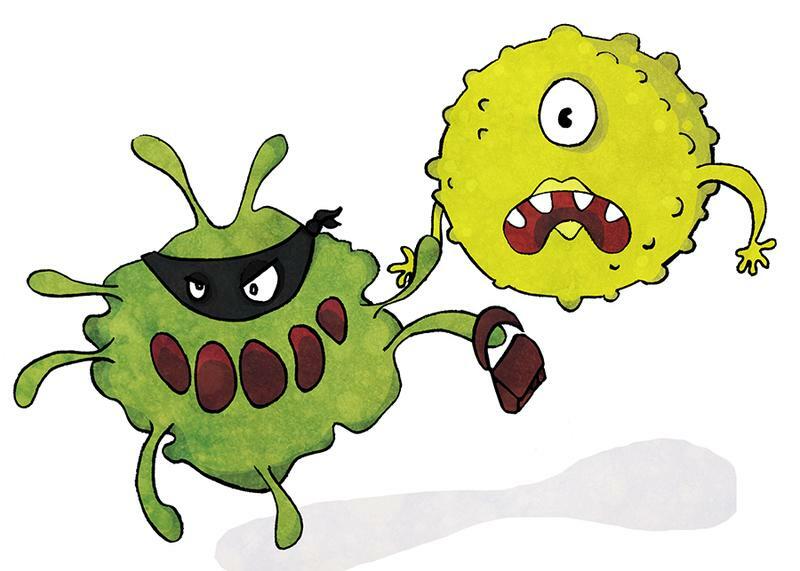 The virus tricks the bacteria’s security guard into letting it in, then hands the guard a note with names of the virus’s competition and tells the security guard not to let them in, eliminating the virus's competition. At least that’s what Suttle thinks the virus does, as the study didn’t demonstrate this, instead only showing the the virus was carrying the CRIPSR sequence — the note for the guard. The team hopes to one day go back to the arctic with this knowledge and see if viruses up there use the same stolen CRISPR system. “This approach of doing very basic research, curiosity driven research, really opens up these new avenues that we didn’t know anything about before,” said Suttle. "It gives you all kinds of new ideas and insights into how things work."